In the third week of the course, we focus on how to collect data from Twitter’s REST APIs. In this session we follow closely the script provided by Tony Ojeda, Sean Patrick Murphy, Benjamin Bengfort, Abhijit Dasgupta in the first part of Chapter 10 of their book Practical Data Science Cookbook (pp. 307-327). As background reading for the Python code used in this example serves Lutz (2013). Tony Ojeda, Sean Patrick Murphy, Benjamin Bengfort, Abhijit Dasgupta. (2014). Chapter 10: Harvesting and Geolocating Twitter Data (Python). Practical Data Science Cookbook. Packt Publishing. Mark Lutz. (2013). Learning Python. 5th Edition. O’Reilly Media, Inc. In the second week, the course focuses on introducing students to the concepts of Computational Social Science, Digital Methods, and Big Data. For this, we use articles by Cioffi-Revilla (2010) and Rogers (2010). In addition to these surveys of the field, two articles by Conover et al. (2012) and Hanna et al. (2013) serve as examples as to how one can approach research questions in political science by using Twitter data, either through network analysis or time series analysis. Cioffi-Revilla (2014), Lazer et al. (2009), and Rogers (2013) serve as background reading. Hanna, A., Wells, C., Maurer, P., Shah, D.V., Friedland, L., & Mattes, J. 2013. Partisan alignments and political polarization online: A computational approach to understanding the French and US presidential elections. In I. Weber, A.M. Popescu, & M. Pennacchiotti (Ed. ), PLEAD 2013: Proceedings of the 2nd workshop politics, elections and data (pp. 15–21). New York, NY: ACM. Lazer D., Pentland A., Adamic L., Aral S., Barabási A.L., Brewer D., Christakis N., Contractor N., Fowler J., Gutmann M., Jebara T., King G., Macy M.W., Roy D., Alstyne M.V. 2009. Computational social science. Science 323(5915): 721–723. This semester, I teach a course on the ins and outs of the collection and analysis of digital trace data—Computational Social Science, Digital Methods and Big Data in Political Science. The course is somewhat of an experiment as it attempts to teach some fundamentals of computational social science at a political science department to students without prior training in programming or exploratory data analysis. For ease of access, I decided to focus the course on the collection and analysis of Twitter-data. As a backbone of the course, I decided to follow the structure of Twitter Data Analytics [Preprint] by Shamanth Kumar, Fred Morstatter, and Huan Liu. The course will start by teaching students to collect data through Twitter’s API. 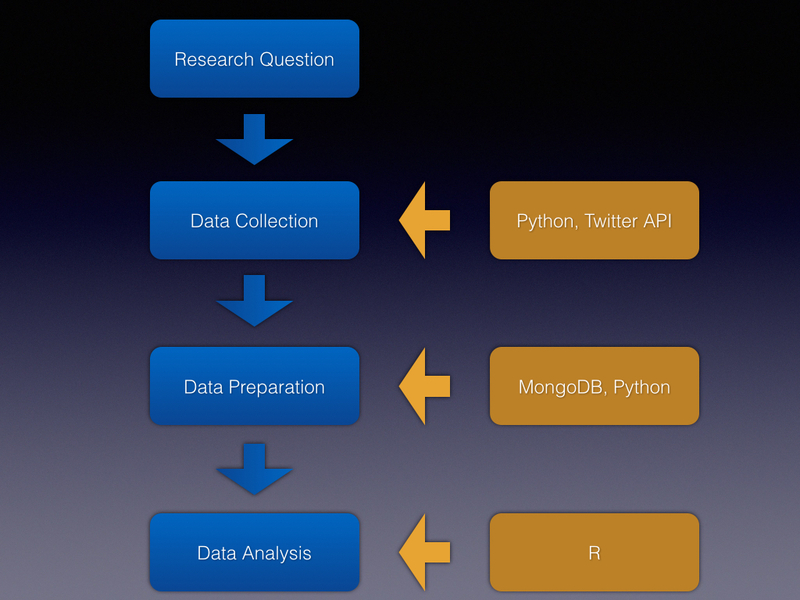 The next session will focus on saving and indexing data collected on Twitter by using MongoDB. In a next step, we will focus on how to transform Twitter-data saved in MongoDB so as to serve as basis for subsequent analyses. In a final step, we will discuss several approaches to analyse Twitter-data with R through network-analysis and time series methods. The students will finish the seminar by completing a research project of their choice, consisting in the collection, preparation, and analysis of Twitter-data. Mark Lutz. (2013). Learning Python. 5th Edition. O’Reilly. Wes McKinney. (2012). Python for Data Analysis. O’Reilly. Zed A. Shaw. (2014). Learn Python the Hard Way. 3rd Edition. Code examples are available in a git repository for the course.